As you probably know by now, I'm a big fan of food and the great outdoors. I often combine these two loves of mine by cooking on the beach over a wood fire. When I started I was completely and utterly useless at it, I couldn't even keep a fire going without a bucket load of fire lighter fluid, but I have slowly been getting better with each attempt. With improvement comes the desire to experiment further and when I saw a day long Asado cooking course being run by someone that I've been following on Instagram for a while, I quickly made my booking. Asado is cooking in its purest form and is usually just fire, meat and a grill. It's the main means of cooking food in Argentina, Brazil, Uruguay, Chile and Paraguay and I've always thought that the simplicity of slow cooking meat over a wood fire has a certain kind of allure that can't be recreated in a kitchen. I knew the course was 'up-country' but I didn't really think too much about it until the day before when I discovered that it was taking place in Wiltshire. A quick glance at the map and I realised that it was about an hours drive from the coast and as I zoomed in on google maps the words 'Durdle door' came into view. 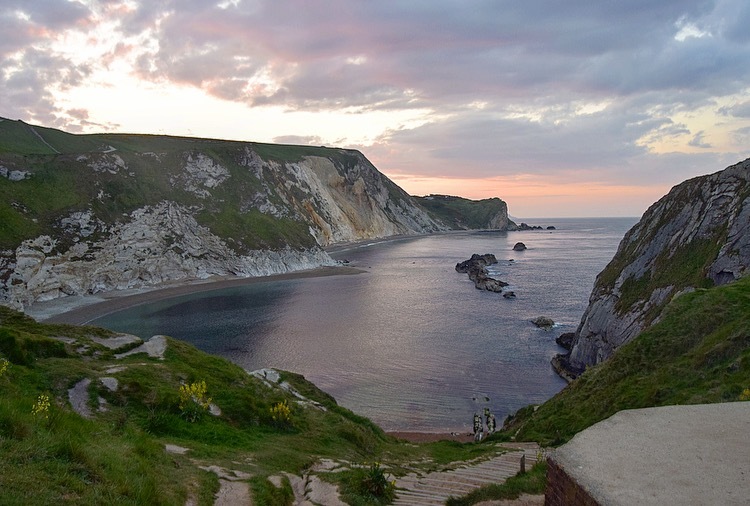 I have an ever growing list on the notes app on my phone of places that I want to visit and Durdle door is on there. I asked Leigh if I could take the van and I made a plan to drive up there that night, sleep in the van overnight, wake up at 5am the next day, watch sunrise at Durdle door and then make the hour drive to my asado cooking course which began at 9am. The logistics were far from perfect. It meant driving Leighs van, which I was unfamiliar with, for 3 hours up country with no AA cover (we realised 20mins before I set off that my AA plan doesn't cover me in Leighs van, which wouldn't be a problem if Leigh's van wasn't a 2002 VW T4!). It also meant sleeping in the van on my own (scary), turning up to a place that I've never been to before and navigating down a cliff side in the pitch black to watch sunrise on my own. I was about to back out of my master plan and check into a hotel around the corner from my cooking course when I realised that some of my most perfect days have grown out of imperfect plans. I programmed the sat nav for Durdle door. I arrived at Durdle door at 23:00 and pulled over to sleep for the night. As I looked out of the window all I saw was woodland lit up by the night sky. It could have been romantic and quaint had I not been sleeping on my own. In that moment it looked like the opening scene of a horror film and an overwhelming sense of vulnerability swept over me. My mind ran through a few nightmarish scenarios and I concocted a plan which involved sleeping fully clothed with the van keys in my hand so that if I was disturbed I could quickly jump into the drivers seat and drive off. I made sure that no one could park in front of me (to hem me in) and told Leigh to sleep with his phone on LOUD. I climbed into my sleeping bag feeling that I had done all I could to sufficiently mitigate against any degree of awfulness occuring. I spent from 23:30 - 04:45 waking every 20mins shivering and ready to dive into the drivers seat at even the slightest noise outside (which of course were magnified by my sense of vulnerability). It was completely and utterly miserable, and at 4.45 I gave up all hope of getting any more sleep and decided to start my walk along the coastal path to Durdle door, at least moving would keep me warm. Suddenly it all became worth while. As first light illuminated the coastal path and the white cliffs began to appear into view, the calmness rid me of any anxiety that was still hanging over me from the night before. I walked down onto the pebble beach and the crunching beneath my feet, along with the gentle waves lapping on the shore, were the only sounds I could hear. I set up the kelly kettle, lit a fire and made some freshly brewed coffee to watch the sunrise with. Life was nothing short of perfection in that moment. I had no luxuries at my disposal, I was sleep deprived and on my own but nature was taking centre stage and doing a pretty good job of filling me with joy. I later got talking to two photographers who had camped overnight on the beach in order to do a time lapse video of sunrise. I suddenly felt lucky to have had the limited insulation of the van walls to protect me from the elements last night. In contrast, they had woken up with frost on their sleeping bags but insisted that the photos of the Milky Way over Durdle door had made it worthwhile, I didn't disagree. I admired their commitment to capturing the poetry of mother nature. Their instagram handles are @bothhemispheres and @mattiabicchi if you want to check them out. I didn't have long there before I had to make the hike back up the cliffs to my car. I arrived at my car out of breath but finally warm. I took one last look at the horizon and jumped back into the drivers seat to drive an hour to my cooking course. I drove through country roads lined with wild garlic and finally arrived at the Pythouse Kitchen Gardens, the venue for my course. I walked under the arch, through the vegetable garden and down into the apple orchards to see a roaring fire in the midst of sweet smelling apple blossoms. Throughout the day, Tom, our host (@countryfirekitchen on instagram), lead us through a series of hands on demos that taught us about different cuts of meat, how to attach them to the metal crosses, the different cooking times for each meat, dynamics of fire cooking and lots of other helpful hints and tips that will help me recreate this scene when I get back to Cornwall. At the end of the day we got to sample all the different cuts of meats and fish we had been cooking all day over the fire. The lamb was the pièce de résistance which has been over fire for about 7 hours. The overwhelming feature of everything we sampled was how juicy and succulent it was. This slow style of cooking preserves all the juices, tenderises the meat and enhances the flavour. It was northing short of sensational. The overriding lesson from these two different experiences of the day was that slow and impractical wins the day. Yes, it would have been easier to book a hotel next to my course rather than sleep in the van but I wouldn't have got to feel the stillness of sunrise, experience a new place in its natural state rather than full of tourists in the mid day sun, or have the conversations that I had with the photographers on the beach. And Yes, it would certainly have been easier and quicker to cook the meat in an oven but would it had been as juicy, and would I have had the time to really get to know all the people who sat around the fire with me, would we all have got to appreciate the beautiful surrounding of the Pythouse Kitchen Gardens, and would I have spotted the adjacent fields full of wild garlic that took me another little wild foraging expedition of my own? Probably not. Slowness makes way for beauty and inspiration yet much of our lives are geared up for convenience and speed. I wonder what joys these 'conveniences' are stealing from us. How could you make more room for slow moments in your life? Now check your inbox for the confirmation email that we've sent you. Don't forget to check your junk mail if it doesnt come through.